One of my favorite visions is that of family lingering around a meal on our back porch. 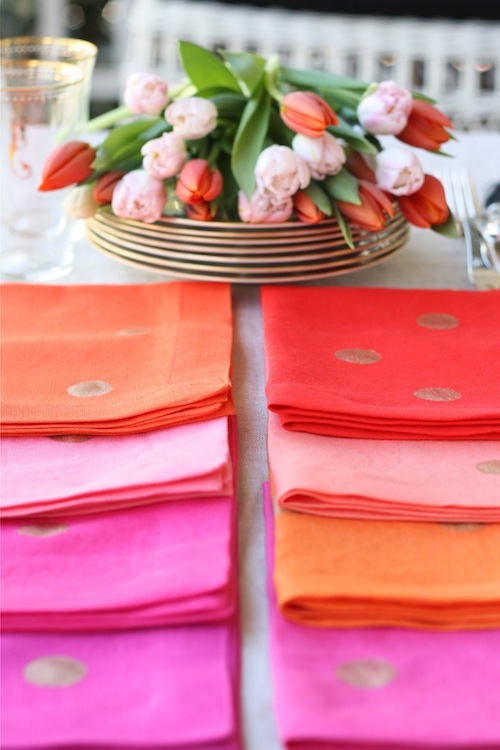 I made these mitre-edged linen napkins in a spectrum of pinks and oranges to dress our table for Easter, but I think we’ll be using them for years to come. 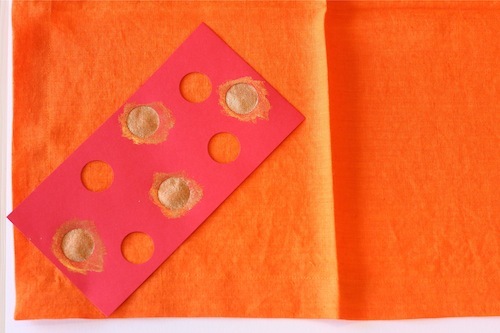 To give them a bit of added happy, I “sprinkled” the napkins with gold confetti, painted on in an abstract pattern. I love the way the gold accents relate to our china without being too fancy. I also love that I was able to create something special for our family so easily — the sewing skills required for this project are minimal, and the painting is done with a stencil. Enjoy! 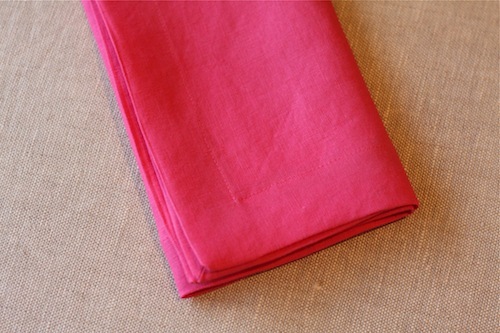 – For each 20” napkin (a standard size), you’ll need 3/4 of a yard of linen. 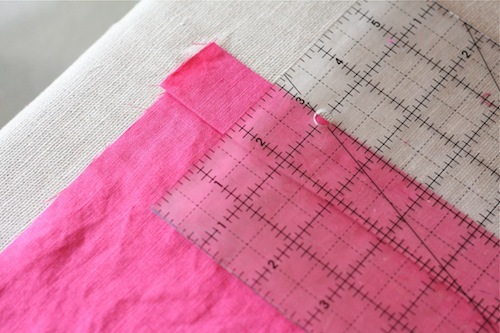 Depending on the width of the fabric you choose, you may be able to cut two square napkins from this amount of yardage. Since I wanted a different color for each napkin, I only cut one per fabric and saved the leftovers to make a coordinating set of placemats. – Basic sewing supplies, including a point turner and an iron. 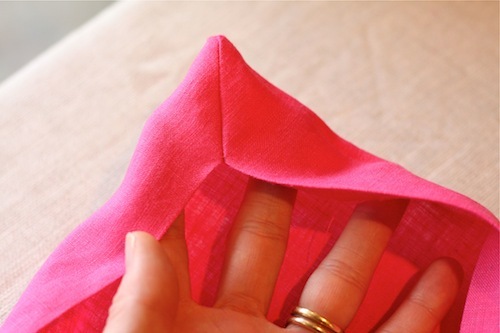 Wash and dry your linen (this is really important as linen shrinks considerably), then press. 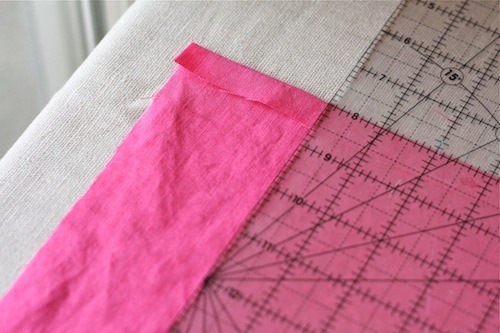 Cut linen into 23” squares. 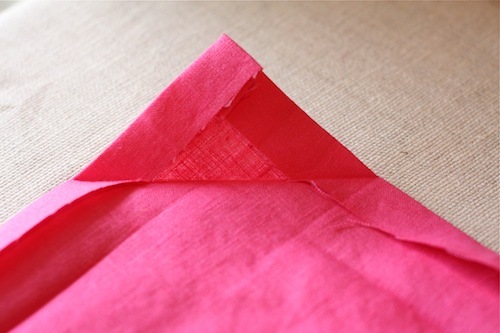 Using your iron, press a 1/2 inch fold into one side of your linen square, then fold an additional 1 inch and press. Unfold the second (1 inch) fold, leaving the crease. Now, repeat the entire process for the other three sides of the square. 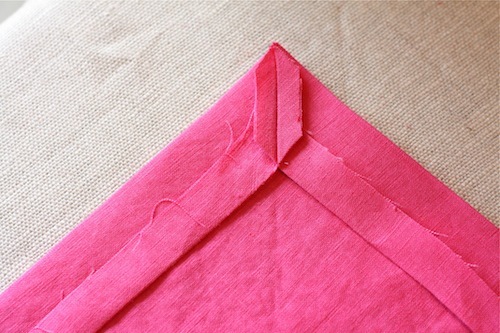 Fold each corner forward so that 1 inch creases line up, as in the photo above. 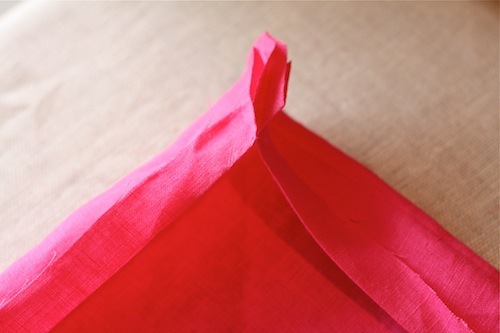 Now, unfold the corner and fold the entire napkin in half backwards so that the two ends of the crease you just made are lying on top of one another. Pin on either side of this crease. Repeat for the other three corners of your napkin. 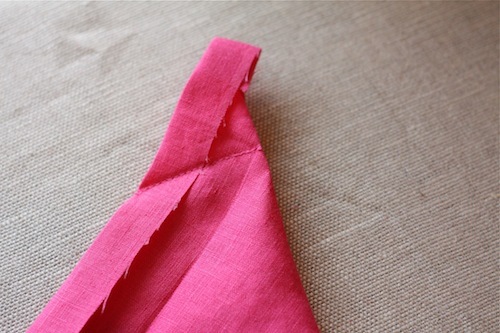 Sew a straight stitch over the crease on each corner of your napkin. 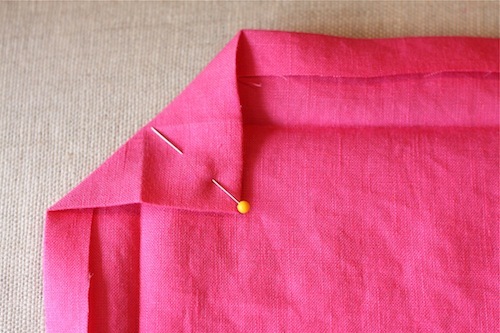 Cut off the fabric’s corners approximately 1/2 inch beyond the seam, then cut the tiny squared corners of this leftover area to a 45 degree angle. 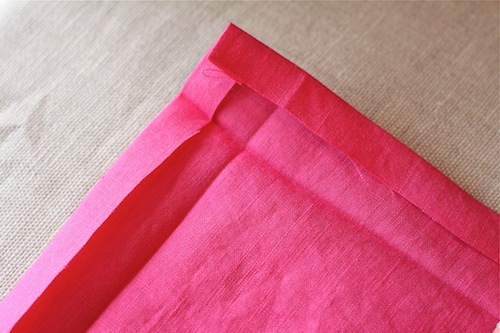 Unfold your napkin and press the corners with seams open. 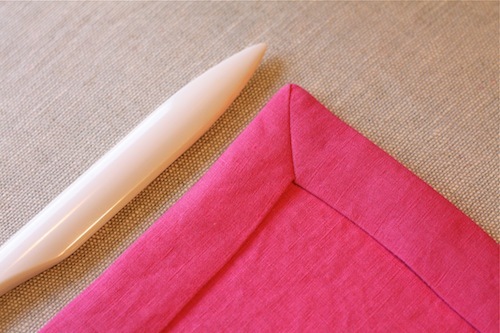 Turn the napkin inside out, using a point turner to push out the corners. 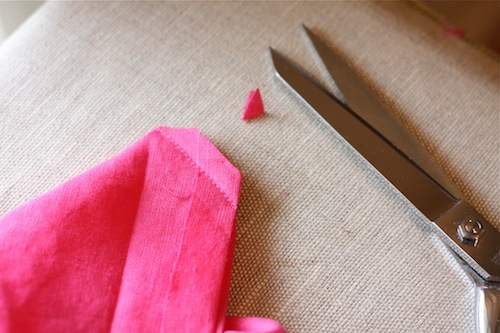 Press the edges down along the 1 inch crease all the way around the napkin. 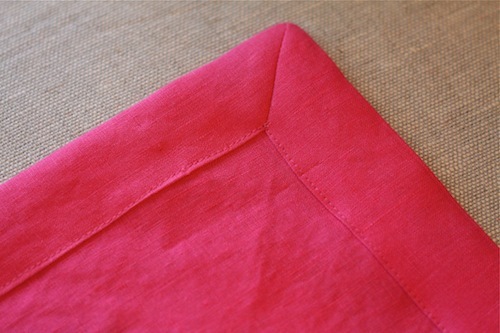 Stitch edges down as close as possible to the inner fold of the napkin. Press your finished napkin, and repeat for the rest of your set (and once you’re done with all that, pat yourself on the back). 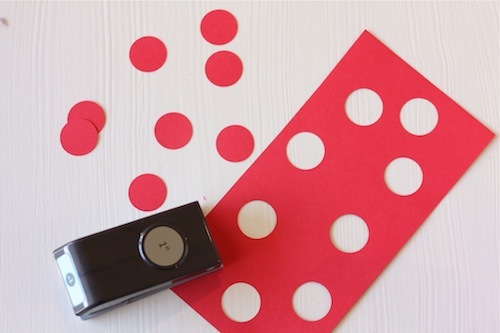 Now, cut your card stock into rectangular pieces (mine varied from 1/2 to 1/3 of each 8.5”x11” piece) and use a circle punch to create an abstract smattering of confetti. Place stencil as desired on your napkin. Then, using a foam brush, gently apply gold fabric paint to the stencil, working from the outside edge of the circle towards the middle. Make sure that your brush is not over-saturated with paint and that you press the stencil down with your hands around the area where you are working. Repeat on other areas of the napkin, turning the stencil to keep the pattern random and switching stencils every two to three uses (it will become less reliable as the circles are saturated with paint). Let dry overnight and then set your lovely table! Happy Spring! P.S. — Looking for additional mitre-edge sewing instructions? 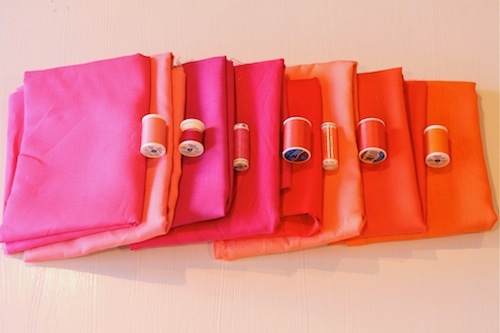 Try the tutorial in Martha Stewart’s Encyclopedia of Sewing and Crafts. You’ll see that I use roughly the same dimensions to get a crisp, 1-inch napkin edge. I have a question for you, Gabrielle, or any of your readers. 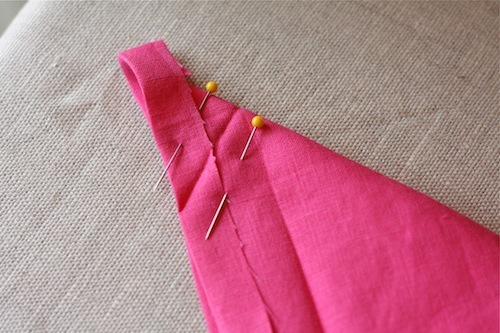 I really have a hankering to learn how to sew and use a sewing machine. I have only had one run-in with a sewing machine when I was 12 and my mother forced me to take a home-ec type class. I hated it because my mother forced me to do it and I purposely emptied my head of all pertinent information as soon as the class was over with. So my question is, where should a beginner start?! Do I invest in a machine right off the bat? Try to find a sewing class where they let me test drive one? Should I just start with a sewing needle and thread and expand from there? I can’t even thread a needle!! I’d take a sewing class first. 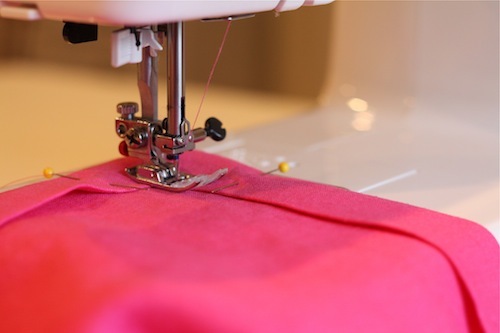 A basic sewing machine can easily cost $100 – $200, which seems like a lot to spend on something you may not like doing. Many sewing machine stores offer classes, and you sew on their demo machines. Reading Meaghan’s comment was weird for me – I could have written it, exactly! Even took the Home Ec class where I made a skirt that could have fit 3 people at a time! Looking forward to seeing the answers! I love these! 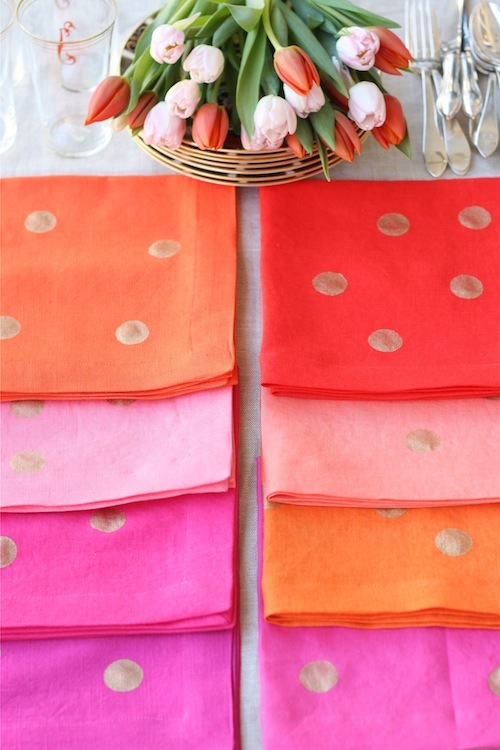 Mitred napkins have been on my sewing to-do list for a while, and this may be the inspiration I need to give them a try. 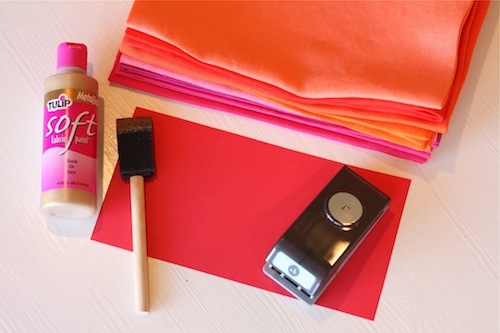 The photo instructions for how to make those corners are super helpful — and, of course, the confetti is a great touch. Thanks! @Meaghan: I’m in a similar position (i.e., learned sewing as a kid, didn’t stick with it, and am trying to relearn now — I actually wrote about overcoming my sewing fears here: http://goo.gl/i8lXA), but I’m lucky in that my mom teaches sewing classes so she has no end of helpful advice for me! 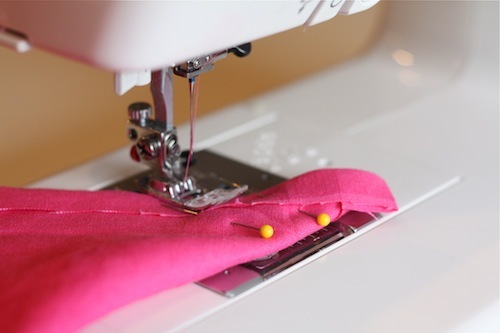 And if it makes you feel any better, my mom says that every one of her beginner students insists that they absolutely cannot sew, are unteachable, etc…and they always finish the class triumphant in their new-found abilities. 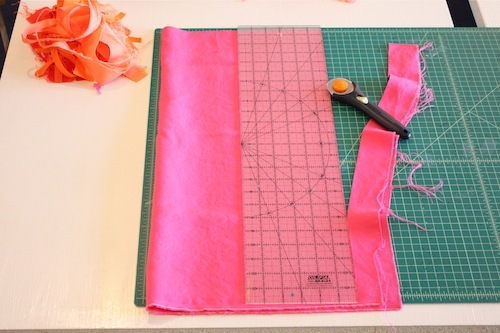 Don’t worry if you can’t thread a needle yet — we all have to start somewhere! I think that Mags’ suggestion of a sewing class is a wonderful one, and probably the best possible way to start. I didn’t do it that way, though–at the time I wanted to learn, I had a toddler and an infant at home, and just couldn’t work out the timing. So I borrowed an OLD sewing machine of my mom’s, along with the instruction book, and just taught myself the basics slowly. I’ve found that the instruction manuals tell you everything you need to know if you just take the time to read them and try things as you go. I began with a very simple flag garland, which gave me the opportunity to practice a straight stitch over and over. Next I think I sewed an applique onto a t-shirt, made some coasters, then a hankie for my husband, and soon after a romper for my son! I just kept following really basic tutorials and looking up things I didn’t know in the manual. And, of course, learning from my mistakes. I learned that machine sewing is really a matter of following directions and developing confidence with practice, rather than an art–I truly think that anyone and everyone can do it. And there is always more to learn. So be encouraged! You’re going to love all the creative possibilities. The colors are beautiful! And the mitered edges are lovely. So fresh! Lovely. Do you know where she bought the linen fabric? These are just glorious….the colors, the gold, the mitered corners. Have you washed them yet? Did the paint survive the washing? Can’t wait to make some!! Hi thanks this was great. I took a sewing class and started a jacket but never finished it because the teacher made us wait so long on doing the next thing I gave up. @Nan: I bought the fabric at a local fabric store in Atlanta, Gail K. Fabrics, and unfortunately, they don’t sell online. 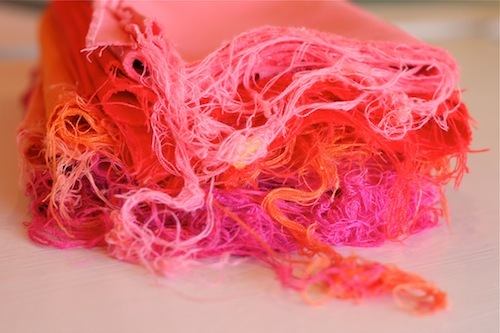 But I recommend trying your local fashion fabric supplier and sorting through the linens there–I found many of these hidden away under other, less inspiring bolts. I LOVE this! Love the colors + gold. 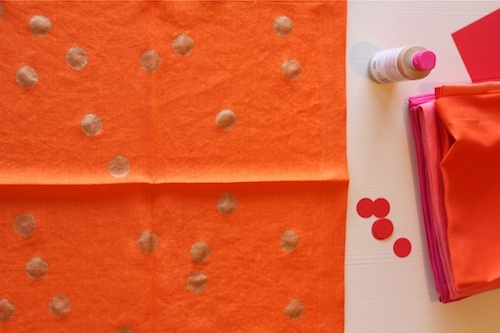 I featured your DIY on my polka dot DIY trend blog post today. Love this! Do you think I could use the gold circle technique on thicker paper napkins? 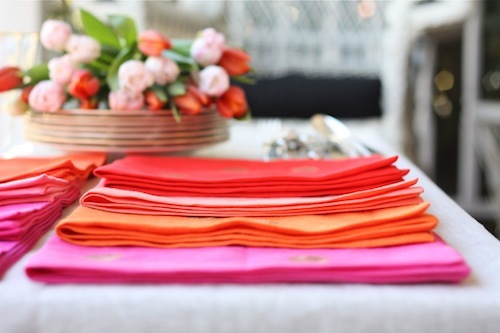 I love those napkins. I would like to make them for my wedding this summer. 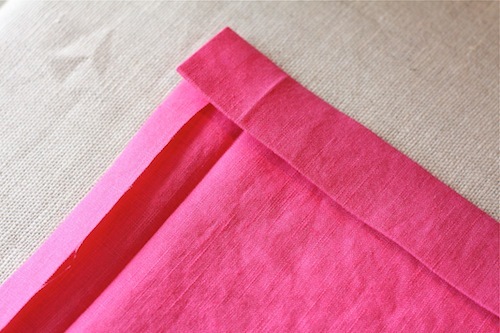 As a new beginner in sewing, can I ask which type of linen you buy for napkin? Cotton? Polyester? For example, if I’m looking on Joann’s or Michael’s website, which categorie I choose to get a fabric that looks like yours? The dots on these napkins remind me of dice or dominoes. For a fun set for a game night, it would be neat to place the dots to resemble dice or dominoes. I pinned these a while back and just re-read it and made my first one for my daughter-in-law. Thank you so much. I will never again have to use *%$#@*& language while I make corners. I’d love to get some more information on the type of linen fabric you used. Was it 100% linen? Did it have a marking on the bolt as to what type? My local fabric store caries 100% irish linen ($30 a yard, very soft and fluid), Dressmaker’s linen ($20 a yard, rougher), and some other cheaper stuff, but I really have no idea what I should be using for napkins and table cloths. Any advice would be greatly appreciated! 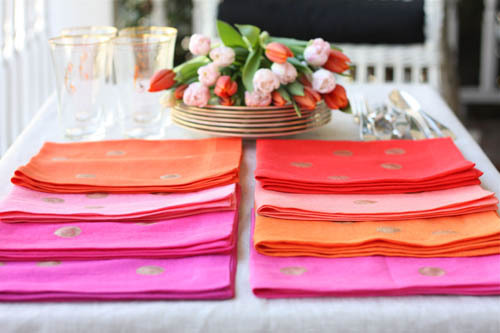 Love the luscious colors of these napkins! Exactly what I’m looking for. My daughter lives in Atlanta and could possibly buy the fabric for me. Where is Gail K Fabrics located? 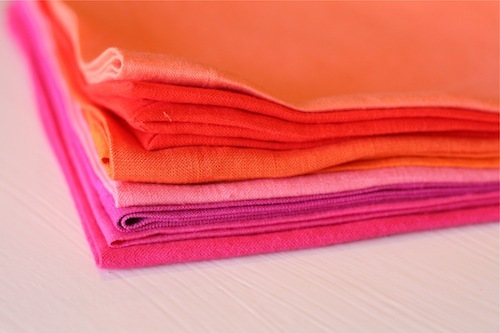 Also, do you happen to know the names of the different colors of linen. Any info would help me. Thanks so much. I would love to make these for my sister and stepmom, but I want to include placemats and a table runner. Even if they don’t match perfectly but have the same colors. I was thinking of doing white/ivory/cream linen with gold for my sister, and maybe red with gold for my stepmom. Anyone have helpful tips or links? Beautiful colors you choose, great instructions and dig the gold dots! where you can place your cell phone and other belongings. twice. Below is the list of some essential skills required for the hockey coach. 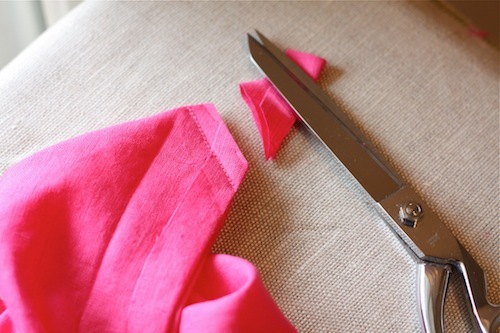 This is the BEST tutorial for making perfect miter corners for cloth napkins! Thank You! Gracias a su tutorial he podido aprender esta técnica de costura tan difícil para hacerlo yo. Muchas, muchas gracias por compartir sus habilidades de costura y su tiempo. Thanks to its tutorial I have learned this technique sewing so difficult to do it. Many, thank you very much for sharing your sewing skills and time.